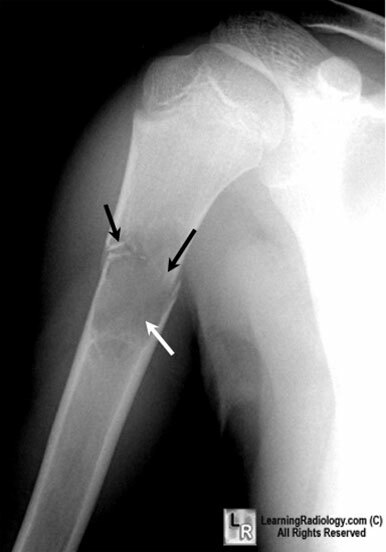 It is discovered after a pathological fracture or as an incidental finding on x-ray. It begins as a spherical lesion but as it enlarges it tends to become oblong. It tends to lie centrally rather than grow eccentrically. The remaining cortex may appear expanded in all direction. The lining membrane consists of flimsy fibrous tissue and often containing giant cell. After a pathological fracture, the lesion often heals spontaneously. Symptom less-Unless a pathological fracture occurs. Well demarcated radiolucent area in the metaphysis, often extended up to the metaphyseal plate. The cortex may be thinned and the bone expanded. Needle inserted under x-ray control. The straw colored fluid will be withdrawn. Active bone Cyst: Sequential x-ray shows the cyst is abutting against the physical plate. Cavity cleaned by curettage and packed with bone chips. Care should be taken not to damage the epiphyseal plate. Prophylactic internal fixation can be done. There is the risk of cyst recurrence. More than one operation may be needed.